← Thank You to the Fraternal Order of Police for New Bikes! 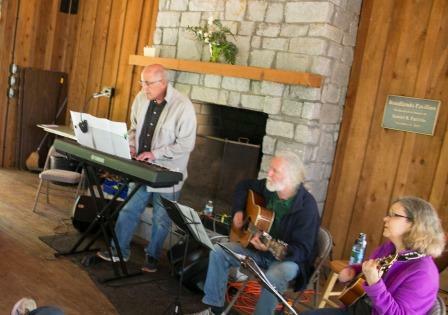 “Music in the Garden” concert series kicks off on Sunday, April 10 from 2 – 4 p.m. Woodlands invites the public to come explore over seven acres of our native garden while supporting talented local musicians. The family-friendly performances are free and open to the public. The concerts take place on Sundays from 2 to 4 p.m., rain or shine, through Spring, Summer and Fall. Guests will get to enjoy the music in our cozy screened-in pavilion that seats about 40 people. Featured musicians perform in a variety of styles, including folk, blues, bluegrass, singer-songwriter and more. For a schedule of the 2016 Sunday concert series and more information about the artists, please visit the Woodlands Garden website at www.woodlandsgarden.org. Woodlands has plans to launch a youth talent showcase this spring called M.A.Y. (Music, Art, & Youth) Fair on Saturday, May 21 from 11 a.m. to 3 p.m. This family friendly event will feature local artists and musicians ranging in age from grade 2 – 12. Handmade art will be for sale at the arts market and musical performances will occur throughout the day. For more information about Music in the Garden click here.